Movistar Estudiantes Madrid (Liga Endesa) signed 24-year old Congolese forward Junior Etou (203-109kg-94, college: Tulsa). He started the season at Sakarya Buyuksehir Basketbol in Turkish BSL league. Etou managed to play in three leagues this year. In 20 BSL games he had 11.5ppg, 7.7rpg, 1.6apg and 1.0spg. Etou also played 5 games in FIBA Europe Cup where he recorded 12.8ppg, 6.4rpg and 1.0apg. 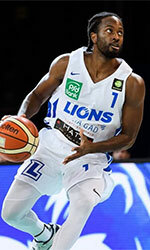 And finally he contributed to 2 games in Basketball Champions League where he averaged 10.0ppg, 3.5rpg and 2.0apg. The last season Etou played at The University of Tulsa in NCAA. In 30 games he got 14.9ppg, 7.9rpg and 1.5apg. A very impressive season as he was named to All-AAC 2nd Team and NABC NCAA D1 All-District 25 2nd Team. He graduated from University of Tulsa in 2018 and it is his first season as a professional player.